Corresponding author. E-mail address: qjwang@chem.ecnu.edu.cn (Q. Wang). Abstract: The detection of Staphylococcus aureus (S. aureus) is very important as it is responsible for bacterial infectious diseases and food poisoning. In this paper we explored the application of fluorescently labelled vancomycin to specifically bind and detect S. aureus. In view of the specificity of vancomycin towards bacterial cell surfaces, we utilized Cy5 to label vancomycin (Cy5-Van) for the identification of S. aureus. Our experiments were designed to examine in greater detail the specificity of the reaction between Cy5-Van and S. aureus. 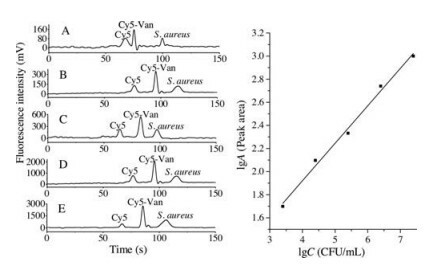 Detection parameters such as the derivatization conditions, concentrations of buffer, pH value, response performance of Cy5-Van to bacterial surface, injection time and reversed-polarity time have been investigated and optimized. To develop a simple and quick assay for the detection of S. aureus at low concentrations, we propose to use the Cy5-Van for labeling the S. aureus coupled with an on-line multiple-concentration in microchip electrophoresis. Under the optimized conditions, the detection of S. aureus was achieved within 150 s with limit of detection (S/N=3) of 981 CFU/mL, and 350-fold enhancement was obtained for S. aureus as compared to using the no concentration step. It is selfevident that this approach has great potential in the future for the analysis of S. aureus. The detection and identification of pathogenic microorganisms, including bacteria , viruses , and fungi , are crucial to ensure the safety of the consumer and of the patient, maintain the product quality, and meet the regulatory requirements. Therefore, developing rapid, sensitive, and broadly applicable methods to identify and monitor such microorganisms is of paramount importance. Currently, several analytical methodologies have been made to test potentially dangerous microbial agents [4-11] while these methods present drawbacks such as high instrument or reagent cost, complexity, time consumption, or low detection limits. Microchip electrophoresis (MCE) has been explored for the possibility of analyzing bacteria and is currently of great interest because of its rapid response, high information exportation and the use of minute amount of samples and reagents. Though MCE has been proved to be used for bacteria analysis, in some cases, the sensitivity of MCE is not sufficient because of the low sample volume and short separation distance characteristic of the method [12, 13]. Therefore, a method for rapider and more effective identification of low-abundance bacteria is still highly desired. We have used the red fluorescent nucleic acid stain SYTO-62 for labeling bacteria, used a combination of chitosan sweeping, fieldamplified sample stacking (FASS) and reversed-field stacking (FRS) for the ultrasensitive detection of bacteria using MCE with laserinduced fluorescence (LIF) . Currently, SYTO-62 was mainly used to stain bacteria. However, SYTO-62 undergoes non-specific labeling of nucleic acids abundant in blood, plasma or urine. As a result, SYTO-62 is not suitable for the determination of microbial contamination in biological sample. Therefore, we try to find a new compound able to label bacteria for the detection at lowabundance bacteria by MCE. 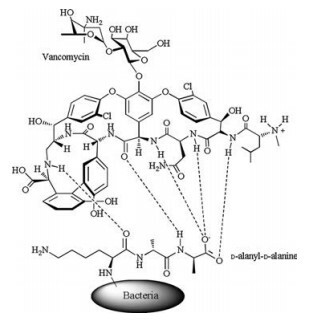 Vancomycin is a glycopeptide recognized as an antibiotic drug because of its capacity to rupture the bacterial cell-wall by specific binding to the mucopeptide [15-22]. Williams and co-worker described the specific molecular recognition of vancomycin to the D-alanyl-D-alanine terminus of the stem pentapeptides present in the bacterial peptidoglycan via hydrogen bonding interactions between the basis of the skeleton of vancomycin and the terminal D-alanyl-D-alanine moieties in Gram-positive bacteria (Fig. 1) [23, 24]. 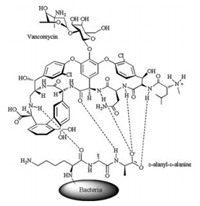 Xing and co-worker reported that the vancomycin group antibiotics have been propelled to the front of fighting against the serious pathogen like Staphylococcus aureus (S. aureus) and methicillin resistant S. aureus (MRSA) because of its clinical significance in treating Gram-positive bacterial infections . Lin et al. have employed vancomycin-modified magnetic nanoparticles as affinity probes to selectively trap Gram-positive pathogens from urine sample on the basis of specificity for the D-Ala-D-Ala units of the cell walls for vancomycin . In the view of using the specific binding of vancomycin to bacterial cell surfaces, we utilized Cy5 to label vancomycin (Cy5- Van) for the identification of S. aureus. Our experiments were designed to detect in greater detail the specificity of the reaction between Cy5-Van and S. aureus. We investigated and optimized the detection parameters such as the derivatization conditions for Cy5 labeling of vancomycin and derivatization conditions for Cy5-Van labeling of S. aureus. In comparison with the method of nucleic acid labeling, this strategy avoids the background nucleic interference from S. aureus. This paper discusses the response performance of vancomycin to the bacterial cell surface. After a series of experiments, we combined field-amplified stacking (FASS) and reversed-field stacking (RFS) in a multiple-concentration approach for MCE detection of S. aureus. Because the proposed method ensures satisfactory sensitivity and excellent enrichment simultaneously, it provides a fast and feasible for the detection of S. aureus. In order to achieve the best results, various experimental conditions were investigated and optimized. The experimental section was placed in the Supporting information. The derivatization of vancomycin with Cy5 was tested in the first step of the experiment. The scheme of the labeling reaction is depicted in Scheme S1 (Supporting information). In the process of derivatization, influential factors including pH value and concentration of borate buffer solution, and time of the reaction were examined to obtain the maximum stable fluorescence yield. The reaction was performed by varying the pH (7.5–10.0) and the concentration of borate solution (10–90 mmol/L), while keeping the other parameters constant. The maximum LIF signal was obtained when increasing the pH value up to 8.5 above which the signal decreases due to the hydrolytic degradation of the Cy5 and the high ionic strength that may reduce the reaction rate of both cations and anions. The pH value of the buffer system and the variation of the buffer concentration may lead to the formation of boric acid ions and hydroxyl groups of vancomycin forming a strong negatively charged complex. Therefore the pH value of 8.5 was kept constant while optimizing the borate buffer concentration. The results demonstrated that a concentration of 20 mmol/L derivatization borate buffer was found to achieve maximum reaction efficiency in the labeling reaction (Fig. S2 in Supporting information). At the same time, the reaction temperature and the time had an important influence on the derivatization yield. The experimental results also demonstrated that the reaction required darkness and 6 h of incubation at room temperature. Under optimal conditions, we can observe two well resolved peaks of Cy5 and Cy5-Van on the electropherogram. Fig. 2 illustrates the highest efficiency of the derivatization obtained. In view of the fact that S. aureus has no native fluorescence, specific markers of S. aureus were detected by derivatizing with Cy5-Van. The derivatization procedure is optimized with regards to the peak area obtained under different conditions. The influence of pH on the derivatization is the most important factor affecting the focusing efficiency. We therefore studied the derivatization at pH values between 4.0 and 9.0. The experimental results demonstrated that the derivatization was mostly successful with the largest peak area at pH 6.0. Therefore, this pH value 6.0 was selected in this derivatization procedure (Fig. S3A in Supporting information). Furthermore, the influence of the duration of derivatization was also investigated. The mixture was vortexed for 30 s and then placed in the dark at room temperature for different durations (2– 7 h). It was found that the maximum yield was obtained by applying 4 h of reaction time (Fig. S3B in Supporting information). Secondly, the conditions of specific marking S. aureus by Cy5- Van were investigated to obtain the maximum fluorescence intensity. The amount of Cy5-Van had a significant influence on the derivatization efficiency. A bacterial suspension (1.5 mL of approximately 2.5 ×108 CFU/mL) was mixed with a solution of Cy5-Van (0.5 mmol/L) at different volumes ranging from 30 μL to 70μL to obtain a final concentration. The derivatization reaction was concentration dependent, and increasing the reagent concentration would improve the derivatization efficiency. 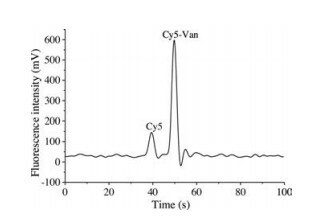 The experimental results illustrated that the fluorescence response of the selected analytes increases when increasing the Cy5-Van volume and levels off when it was higher than 50 μL of 0.5 mmol/L Cy5- Van. The maximum fluorescence intensity of the analytes was hard to obtain when using Cy5-Van volumes less than 50 μL. Therefore, 50 μL of 0.5 mmol/L Cy5-Van was used for all subsequent derivatizations. After above marking procedure, MCE was used to separate S. aureus from the residues of Cy5 and Cy5-Van. In order to achieve higher detection sensitivity while maintaining high resolution, an on-line multiple-preconcentration strategy combining FASS and RFS has been developed and used in MCE [27, 28]. The schematic mechanism of this method is shown in Fig. S4 (Supporting information). With the purpose of controlling the process of aggregation of bacteria and improving the reproducibility, selectivity, and sensitivity of microbial analysis, a number of different MCE approaches have been reported. Wang et al. observed that the electrophoretic profile was greatly improved when an amount of taurine was added to the sample buffer . In this view, some small zwitterionic molecules, including L-cysteine, sarcosine, betaine and taurine were used as additives to improve the detection signal. It is found that these small zwitterionic molecules could improve the sensitivity of microbial analysis and the best result was achieved by taurine. Therefore, taurine was applied as a buffer additive. To induce aggregation of bacterial cells, the concentration of taurine added in the running buffer had to be higher than that in the sample buffer. Therefore, 10 mmol/L taurine was included in the sample buffer, and 20 mmol/L taurine was included in the running buffer. Besides, the pH of the running buffer is a governing factor during the electrophoretic separation. We investigated the influence of the pH value on the electrophoretic mobility of S. aureus. It was found that the best pH range for bacterial detection was 7.5–9.5. As shown in Fig. S5 (Supporting information), rapid detection of S. aureus was achieved at pH 8.5. When the pH value is higher or lower than 8.5, Cy5-Van and Cy5-Van-S. aureus comigrate and overlap. Based on these results, the pH value of 8.5 was determined to be the best pH value for the MCE separation. In order to achieve the highest sample concentration enhancement, injection time and reversed-polarity time have significant effects on the signal amplification and the separation efficiency. Especially for the analysis of microorganisms, the increase in injection time can strengthen the signal intensities of all analytes. During the injection step, the injection time controls the sample volume introduced into the separation channel for preconcentration. However, the limited total length of the separation channel and the retention factor of the bacteria in the micelles are insufficient and therefore the injection time should be optimized. In our study, the injection time was varied from 10 s to 20 s. As shown in Figs. S6A-C (Supporting information), it was found that the long injection time could increase the peak current (Fig. S6C). However, longer injection time was expected to decrease the efficiency and resolution of the separation system. After careful optimization of the injection time, 15 s was chosen as an optimal injection time that allowed complete stacking before the sample reached the detection point. The reversed-polarity step was performed by pushing back the sample plug to provide a longer time for FASS. To further improve the sensitivity, reversed-polarity time is 3 s shorter than the injection time. As shown in Fig. S6B, the optimal injection time and reversed-polarity time are 15 s and 12 s, respectively. Under the optimal separation conditions, the linearity, the limit of detection (LOD) and the reproducibility were determined to evaluate the merits of the proposed method. Fig. 3 displays the calibration curve obtained for the S. aureus suspension (prepared with a 10-fold diluted running buffer). By measuring a series of bacterial suspensions at different concentrations ranging from 2.5 ×103 CFU/mL to 2.5 ×107 CFU/mL, the linearity data were established with a correlation coefficient of 0.9913, and the slope of the calibration curve was 0.6217. The calibration curve equation follows lgA = 0.6217 + 0.324lgC. As shown in Fig. S7 (Supporting information), an enhancement factor of about 350-fold was obtained comparatively to when no concentration was performed. The limit of detection (LOD), defined as 3 times the background noise, obtained by this electrophoretic method for the quantification of S. aureus was 981 CFU/mL. Under the same separation conditions, the S. aureus was analyzed at least 5 times at a concentration of 4.0 ×105 CFU/mL. The calculated relative standard deviation (RSD) of the resulting peak area was less than 5%. Based on the results, the experiment proves to be able to detect bacteria. In conclution, S. aureus has been fluorescently labelled by Cy5 through the specific binding of vancomycin. To develop a sensitive and quick assay for S. aureus at low concentrations, an on-line preconcentration method combining FASS and RFS in MCE has been investigated. Compared with no enrichment, this multipleconcentration MCE strategy for the detection of S. aureus afforded about a 350-fold improvement in sensitivity, and performed some advantages especially in high specificity and high sensitivity. This work was supported by the National Natural Science Foundation of China (No. 21575042). Supplementary data associated with this article can be found, in the online version, at https://doi.org/10.1016/j.cclet.2017.10.026. D.J. Beecher, A.C.L. Wong, Appl. Environ. Microbiol. 60 (1994) 4614-4616. W.S. Law, E.T.T. Tay, H. Feng, et al., J. Sep. Sci. 30 (2007) 1446-1452. T.Y. Liu, K.T. Tsai, H.H. Wang, et al., Nat. Commun. (2010) 1. D.H. Williams, B. Bardsley, Angew. Chem. Int. Ed. 38 (1999) 1173-1193.